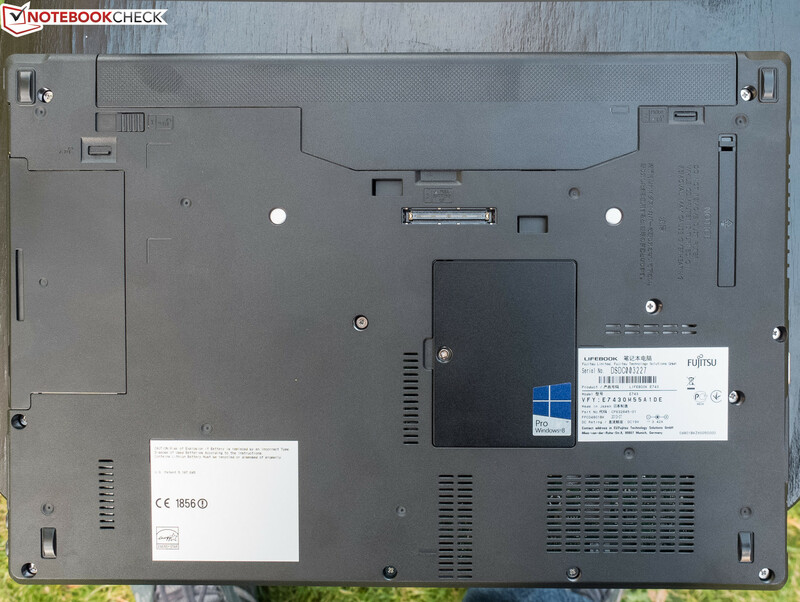 LifeBook E743-0M55A1DE: Only lower-priced or is it also inferior to the E-series' Premium Selection models? 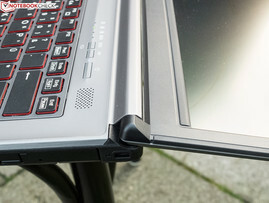 With security features, such as a fingerprint reader, and both a stylish as well as rigid magnesium casing, the E-series LifeBooks from Fujitsu introduced at the CeBIT 2013 are aimed at corporate users. 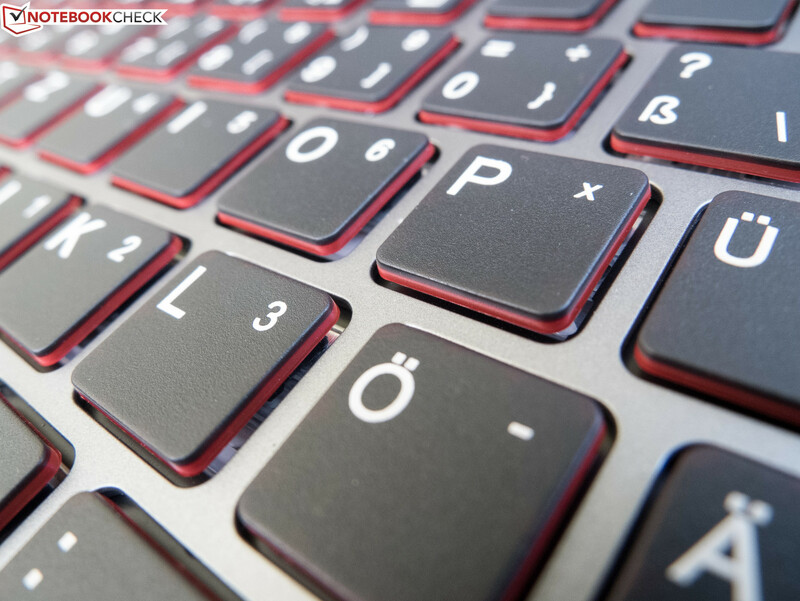 The series includes 13.3" (E733), 14" (E743) and 15.6" (E753) laptops that are based on a modular design and consequently have most components and accessories in common. Administrators and Support will be happy about the lower effort and thus lower expenditures for, e.g. BIOS and driver updates as well as importing images should a company opt for one of the different E-series models for its external workers, for example. 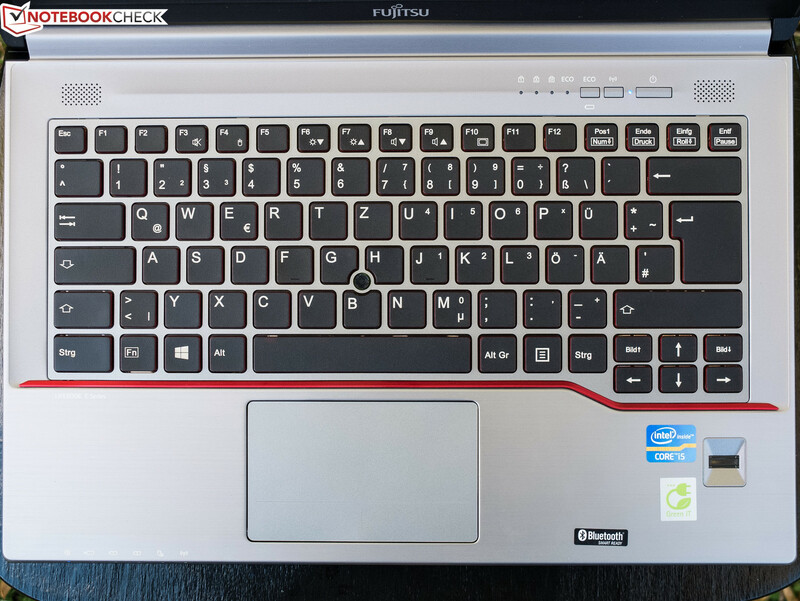 We have recently tested the 15.6-inch Fujitsu LifeBook E753 Premium Selection (Intel Core i7-3632QM, 8 GB of RAM, 256 GB SSD) and the smaller, 13.3-inch E733 Premium Selection with the same key specs. Our current review sample is below both Premium models in terms of performance and price. It is sold for less than 1000 Euros (~$1340) in contrast to 1600 Euros (~$2144), sports the slower Intel Core i5-3230M dual-core, 4 GB of RAM and a conventional 500 GB hard drive. We will use the 200 Euros (~$268) less expensive HP ProBook 6475b (C5A55EA) based on AMD hardware and the elegant AsusPro BU400VC-W3040X ultrabook with an Intel Core i7 ULV-CPU for approximately 200 Euros (~$268) more for comparison. 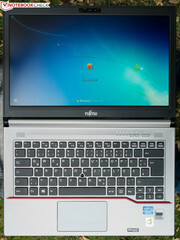 All three laptops feature a matte 14-inch screen, whereas Asus' ultrabook is the only device with just 1366x768 pixels. HP's laptop has the same resolution of 1600x900 pixels as our Fujitsu. 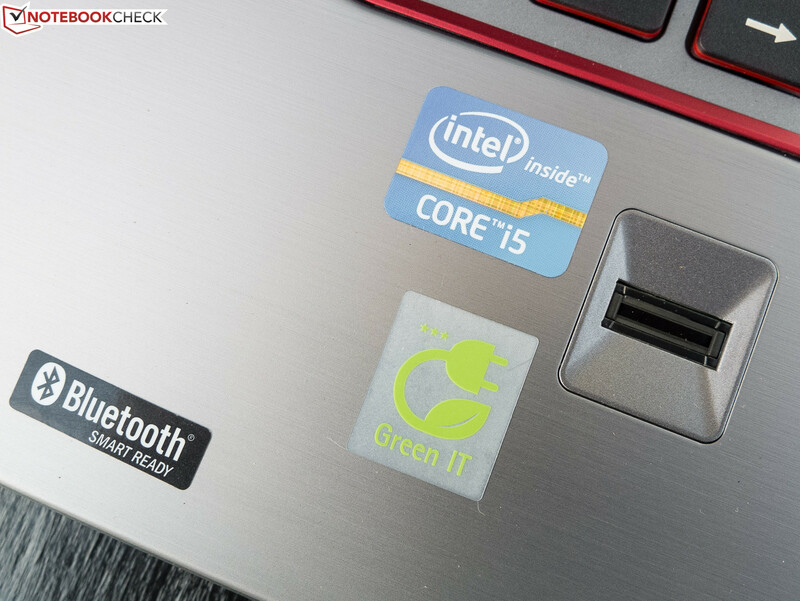 Our test report featuring many benchmarks will show how well the LifeBook E743 will fare against the AMD and ULV competition in corporate routine. A brief summary is provided here: The largely fingerprint resistant casing consists mainly of a magnesium alloy. Only the base unit's underside and display's frame are plastic. The build does not give any reason for complaint; the entire construction makes a high quality and elegant impression with a slight retro look. Unlike the E733, the E743's display can be opened with one hand and the base unit does not need to be held down. The review sample's weight of 1.8 kg (~4.0 pounds) is within the range of other 14-inch devices. HP's ProBook weighs 2.4 kg (~5.3 pounds) while the more expensive Asus only reaches 1.6 kg (~3.5 pounds) on the scales. The maximum opening angle is approx. 190°. The DVD drive can be removed and replaced with, for example, an additional battery. As befitting for a business laptop, the array of interfaces is generous. The user will find three USB 3.0 ports, a DisplayPort and, still indispensable in this category, VGA that enables connecting older laptop projectors. The omitted, very popular HDMI might annoy the user, especially since Fujitsu does not include a DisplayPort-to-HDMI adapter. Pleasing: Adapters will not be needed because all ports are full-sized. Since almost all ports are located on the front sides (rear: 1x USB 2.0), cables or peripherals like USB flash drives might get in the way when using an external mouse. The optionally available docking station with a port replicator, for 123 Euros (~$165) in Fujitsu's shop, adds 4 USB 3.0, DVI and eSATA to the ports on the laptop itself and also has its own power supply with a dedicated adapter that recharges the laptop's battery. 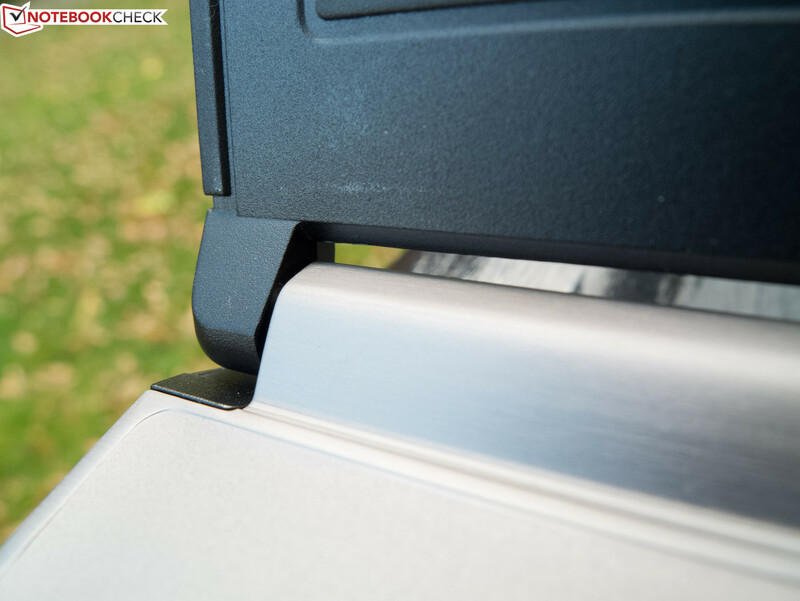 The SmartCard slot on the right indicates business intentions and the modular bay can be fitted with a Blu-Ray drive, a dummy (for lower weight), an additional battery or a small projector besides the installed DVD burner. 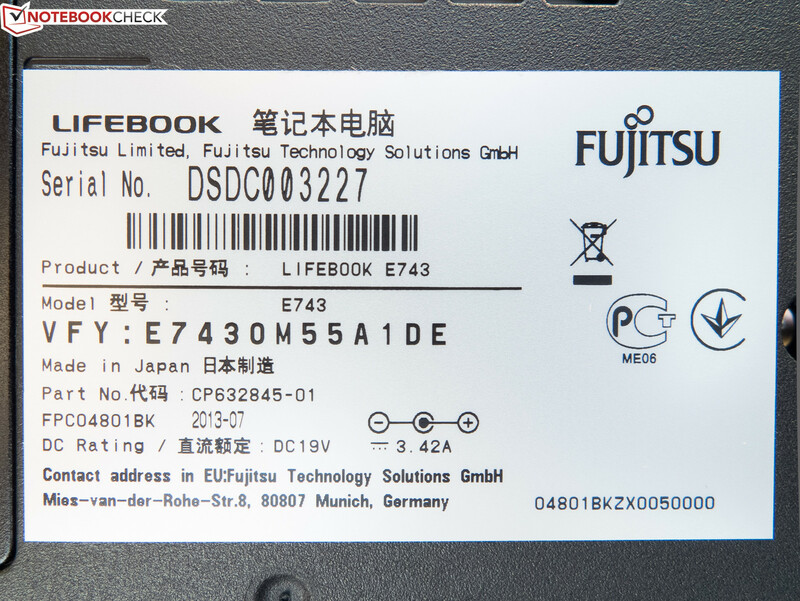 According to Fujitsu's website, the LifeBook E743 is available in various configurations that feature different CPUs ranging from i3 up to i7 quad-cores, larger and smaller hard drives and/or SSDs, and optional UMTS/LTE. The review sample is currently the most sold model. The manufacturer does not offer any alternatives to the installed WSXGA++ screen for users who prefer 14 inches. Intel's Centrino Advanced-N 6235 takes care of wireless communication in Wi-Fi 802.11 a/b/g/n standards and includes Bluetooth 4.0. The module transmits in both the frequently clogged 2.4 GHz band and the still not as busy 5 GHz band where the higher frequency will likely have a positive effect on the transmission rates but a negative impact on the range. In the author's personal test setup, the Wi-Fi's very good range was noticed just as it was in the sister models. Browsing swiftly was still possible without interruptions at a distance of approximately 10 meters (~33 feet) and through two brick walls. The maximum network speed can be achieved with a cable via the flawlessly operating Gigabit LAN. Unauthorized use can be prevented via the SmartCard reader and fingerprint scanner. The TPM module enables clearly identifying the LifeBook E743 on the Internet or in networks from all over the world, and Intel's Anti-Theft technology remote locks the lost or stolen laptop. The hard drive can be encrypted and thus protected via BitLocker under Windows 8 Pro (recovery medium is included). The BIOS can also be protected against unauthorized access via a password. Besides the power supply and a quick start guide, the user will find the following media in the LifeBook's box: Windows 8 Pro recovery, Windows 7 Professional recovery (both 32 and 64-bit), and "Drivers, Manuals & Utilities" for both Windows 7 and Windows 8. We listed the optionally available accessories under "Connectivity". 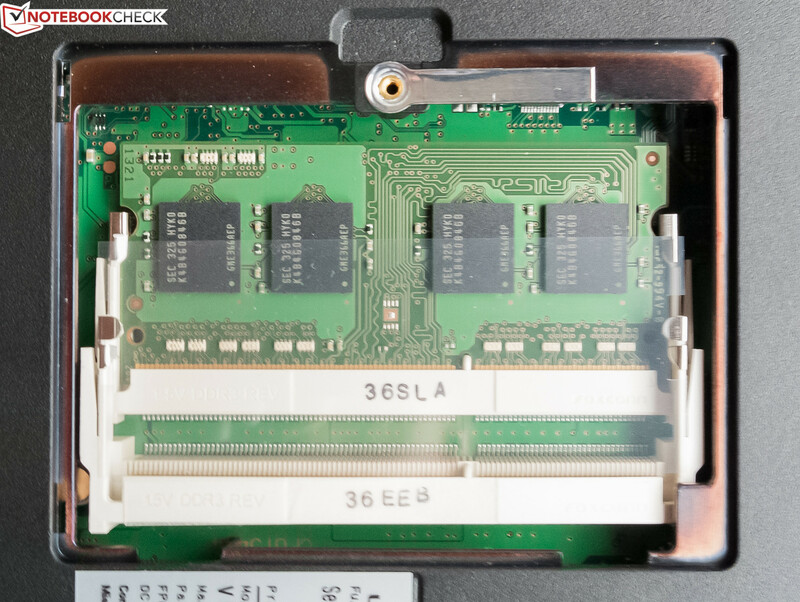 The small maintenance cover regrettably also only allows limited access to the two memory banks, one of which is fitted with a DDR3, 1600 MHz module in single-channel mode. 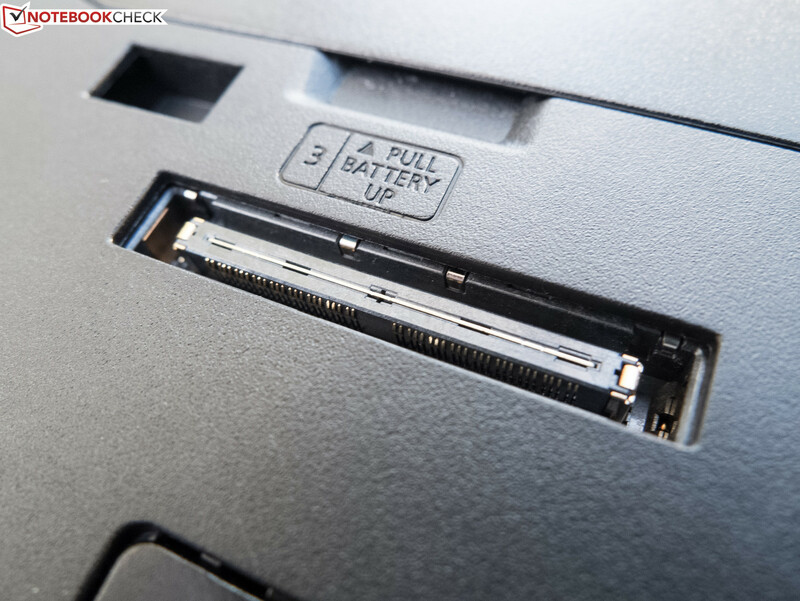 The LifeBook E743 would have to be taken apart to access the fan or motherboard battery. 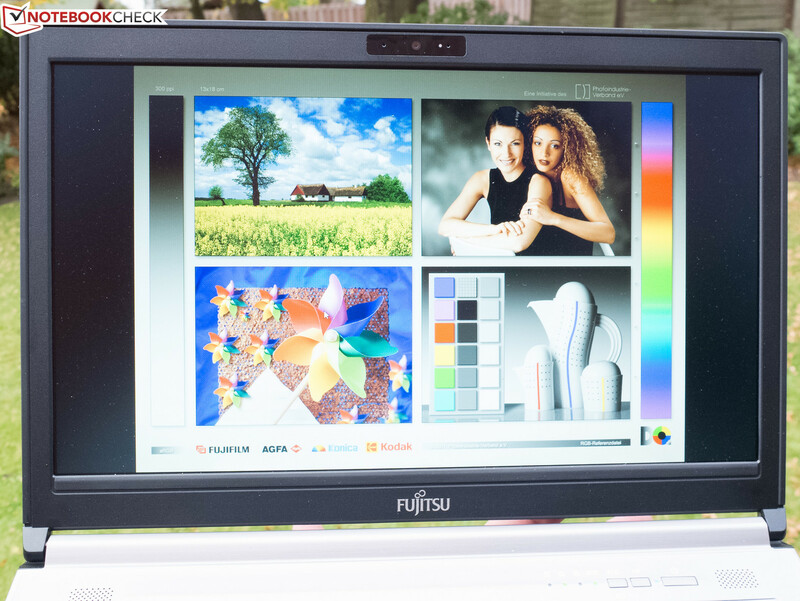 Fujitsu includes a 24-month bring-in warranty as standard. Various, fee-based upgrade packages can be found on Fujitsu's corresponding webpage. 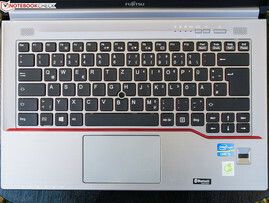 The keyboard on Fujitsu's LifeBook E743-0M55A1DE is virtually identical to that of the LifeBook E733, except it does not feature a backlight. The surface of the rubber-coated and slightly concave keys is much rougher than the Premium model's and the pressure point is less accurate. The noise development remains within limits when typing even more forcefully, and strokes are subjectively cushioned slightly. Although the keyboard is still decent in general, it is not quite as good as that of the E733. The keys' red sides loosen up the entire design nicely due to their subtle, red border. Just like the touchpads in the sister models, the size, smoothness and precision of the completely sleek Synaptic ClickPad V8.1, which does not have physically separated mouse buttons, do not give reason for complaint. However, although the name indicates the same hardware, we noticed two significant differences. First, the touch-sensitive area does not reach as far up to the edges as in the Premium model. Second, and in our opinion more severe, the buttons are difficult to operate. To become confident familiarization is necessary. Gestures using up to three fingers at the same time are detected without problems. The driver menu offers extensive options for individualizing the input device. We would have liked the keyboard if the keys were more pliable. Although the 15-inch devices of the E-series are all offered with Full HD screens based on the viewing angle stable IPS technology, there incomprehensibly are also alternatives with an inadequate minimum resolution of 1366x768 pixels (TN) optionally available. This is not the case in the E743, where Fujitsu consistently relies on 16:9 screens that have a reasonable, if not an ideal resolution of 1600x900 pixels for this format. The screen is matte and is impressive although it is a TN display, both subjectively and on paper. As can be seen in the following diagram, the review sample's screen is superior to that of the compared laptops in almost every manner - which is particularly true for the E733 laptop priced at 1600 Euros (~$2144). 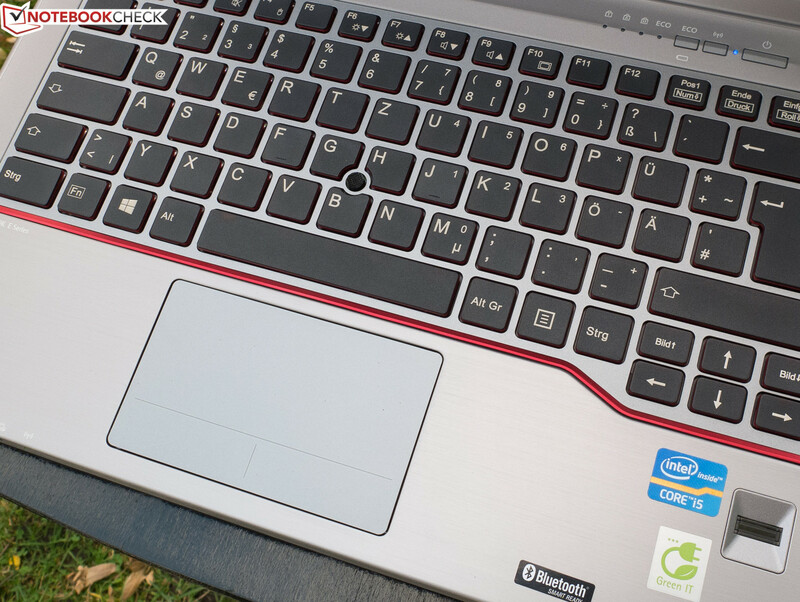 The leader in this comparison is, as expected, the LifeBook E753 Premium Selection model. 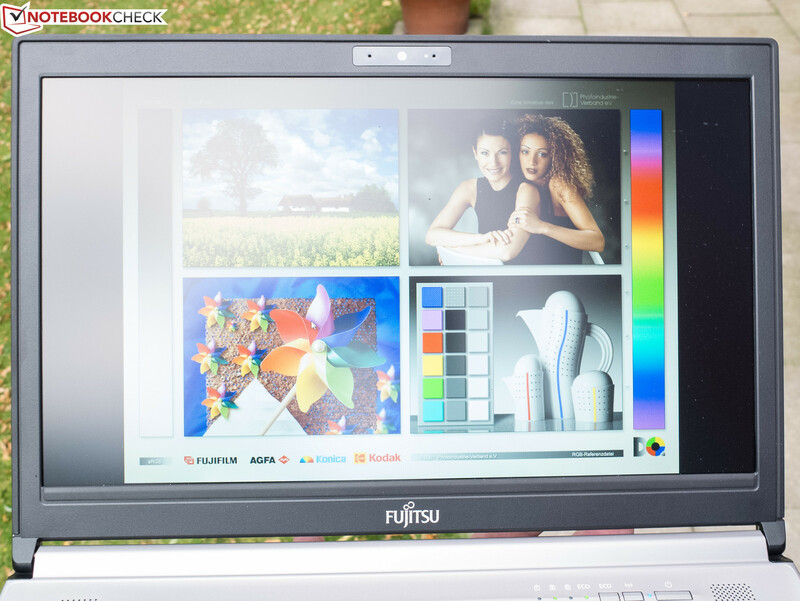 Both brightness and illumination of our Fujitsu E743 are satisfactory, but not exceptional for a device from this price range. We did not observe screen bleeding. A fairly saturated black convinced us in medium brightness, although it is very dependent on the viewing angle. The higher-priced Asus is the only stand out in terms of black value and contrast compared to the others; the review sample only achieves below-average rates here. 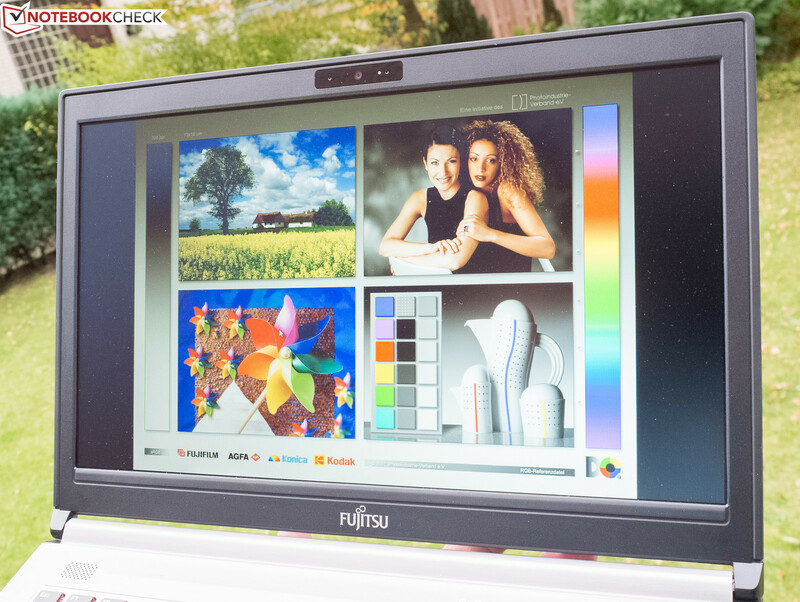 The LifeBook E743's sharpness is beyond any reproach, but not its color space coverage or color accuracy. The latter however benefits greatly from calibration. The average DeltaE rate of 8 in state of delivery is in the lower midfield in the overall comparison of all laptops. Particularly the middle gray hues are not rendered neutrally; blue and cyan color parts are overemphasized. The bluish cast disappears to a large extent after calibrating and a much warmer image impression sets in; the DeltaE drops to good rates below 4. As typical for a TN, not even 40% of the AdobeRGB color space is covered, which is only interesting for professional image editors. The author deems the review sample's image as pleasant and balanced subjectively, particularly when compared with the LifeBook E733-0MPX41DE. 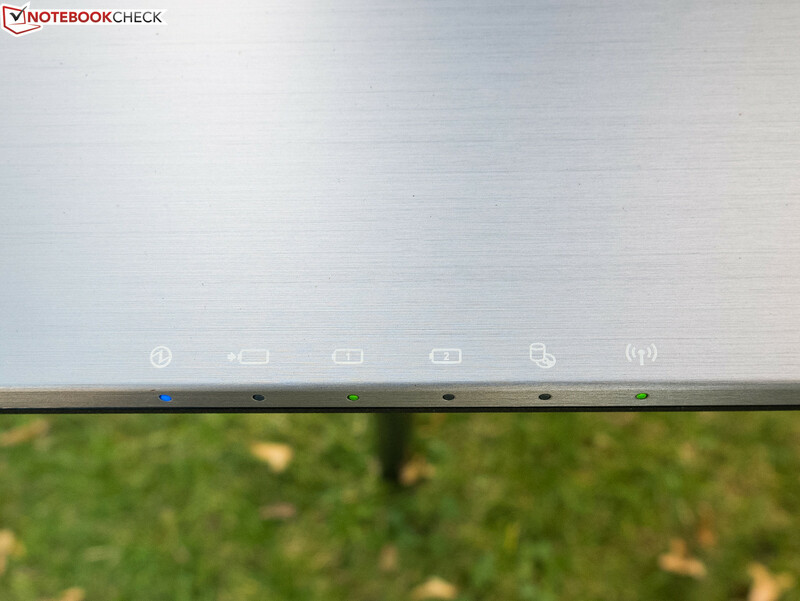 The luminosity of the bright, matte E743 screen is usually sufficient for outdoor use. A very adverse angle to a direct light source would have to be found for reflections to affect the content's legibility. 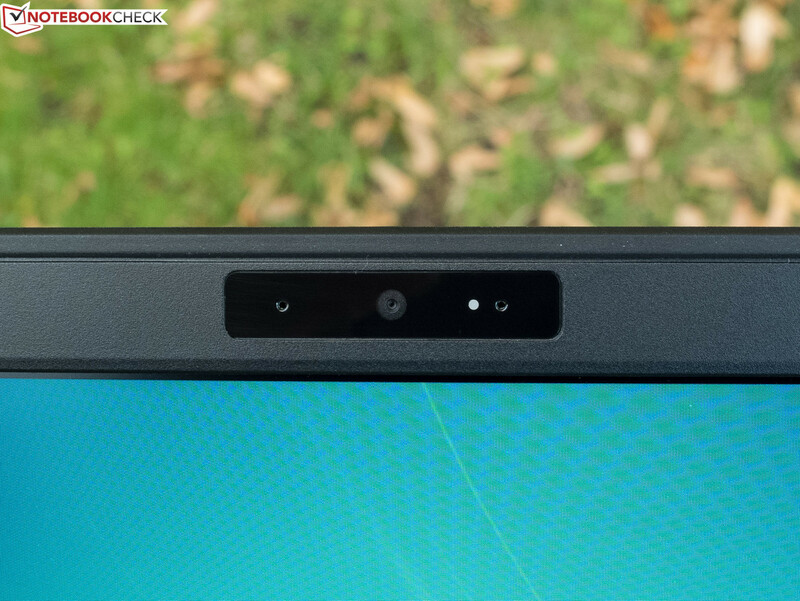 The TN screen's viewing angle stability is poor. The contrasts fade when looking down on the screen and the colors invert when looking up on it. 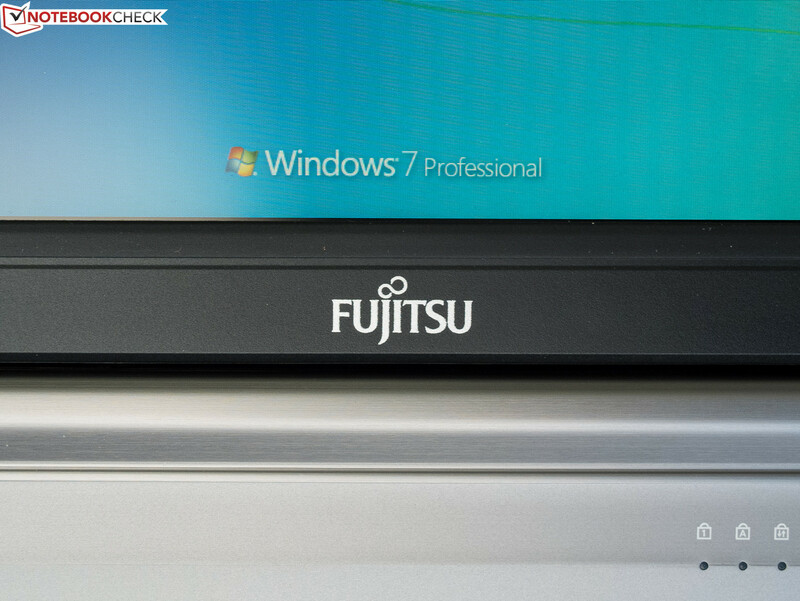 However, this is not as pronounced in this screen from Fujitsu (FUJ5C12) as in many contenders. In particular, only the laterally shifted angle barely has an effect on the image, other than that the picture darkens. 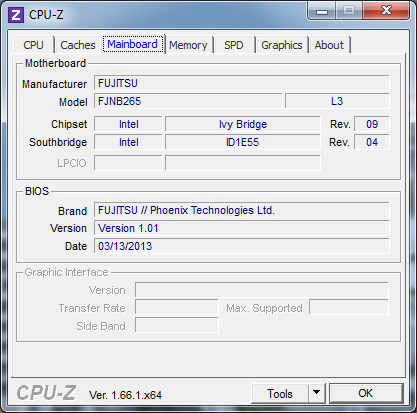 Intel's Core i5-3230M (2x 2.6 - 3.2 GHz; TDP: 35 Watts) from the Ivy Bridge generation clocks inside the laptop. It has two physical cores, supports Hyperthreading and is supported by 4 GB of RAM (DDR3, 1600 MHz, single-channel). As is common for the E-series, graphic calculations are performed by the Intel HD 4000 on-chip GPU, which shares the memory with the CPU. The platform has more than enough power for the intended application field as a business laptop. The use of a conventional hard drive naturally affects boot and wake-up times from standby, as well as program starts. Users who need more power, e.g. for video editing, should perhaps opt for another configuration. According to Fujitsu's LifeBook E743 webpage, a much faster clocked Intel Core i7-3540M dual-core (2x 3.0 - 3.7 GHz; Hyperthreading; TDP: 35 Watts) and a Core i7-3540M quad-core (4x 2.2 - 3.2 GHz; Hyperthreading; TDP: 35 Watts) are available. The latter CPU is a standard component in the Premium models from the series, such as the LifeBook E733, which we also regarded comparatively for the benchmarks of this test. It is also possible to select SSDs in place of hard drives. 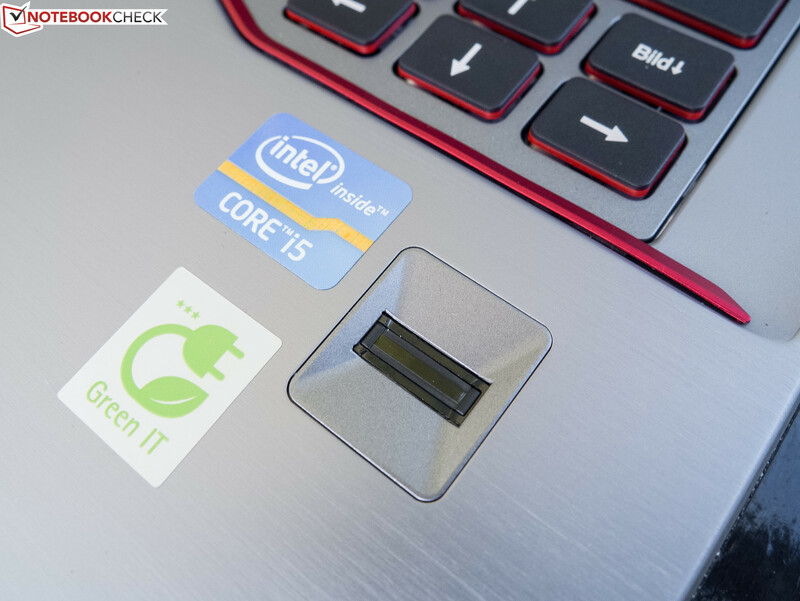 The Core i5-3230M CPU is suitable for more demanding tasks than would usually be the case in a business environment and is often installed in low-cost multimedia laptops. 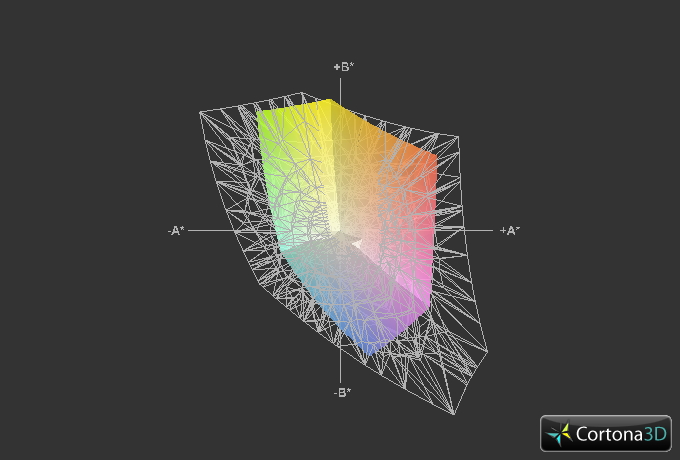 Alongside a strong, dedicated graphics solution from the midrange or higher, e.g. 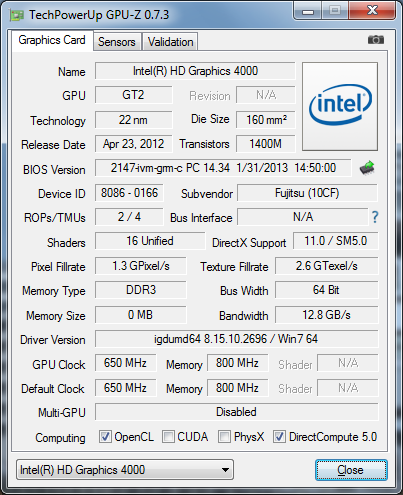 Nvidia's GeForce GT 740M, the performance is sufficient for most current games in medium to high settings. Users of a newer Photoshop or Lightroom version, which sometimes need quite a bit of computing power, might be thankful for the existing performance reserves of our review sample. Besides that, a laptop remains prepared for the future when the performance is not simply adequate at its launch. 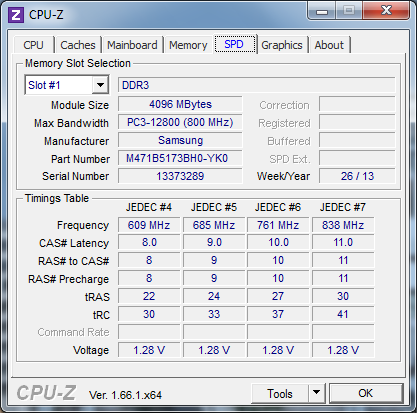 Many details about mobile CPUs can be found in our benchmark list linked in our FAQ section. 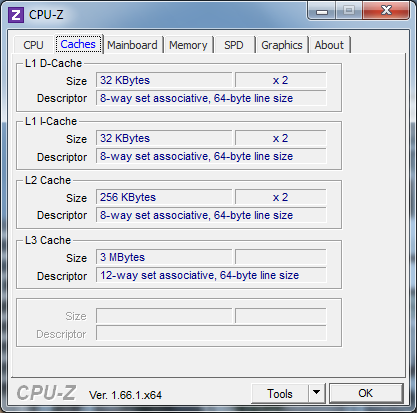 We use Cinebench R10 and R11.5 to ascertain the single- and multi-CPU performance. 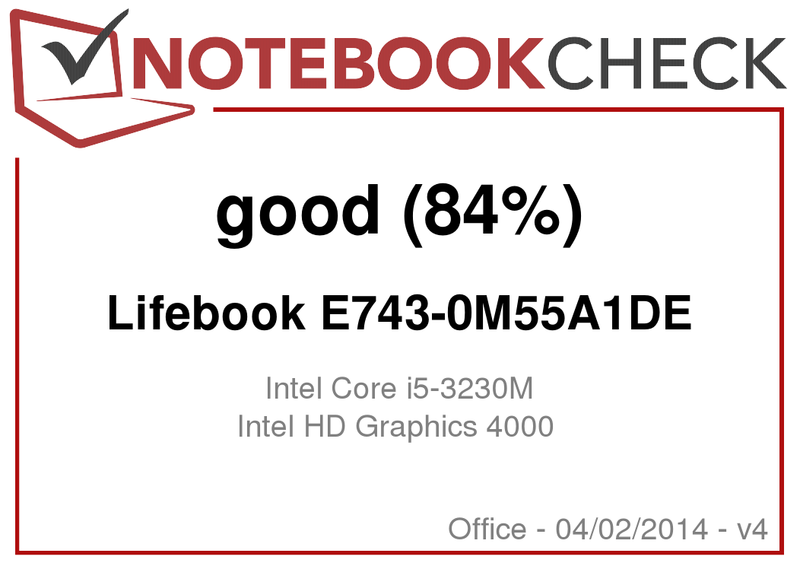 When only one core of the LifeBook is loaded, it is still on a par with the i7-3632QM in the E733 Premium model, but falls behind in the multi-CPU benchmark by a full 80%. HP's ProBook 6475b with its AMD dual-core A6-4400M (2x 2.7-3.2 MHz; Radeon HD 7520G; TDP: 35 Watts) lags behind the review sample with 43% in single and 62% in multi. Our Asus BU400VC-W3040X comparison model, with an Intel Core i7-3517U ULV processor (2x 1.9 - 3.2 GHz; Hyperthreading; TDP: 17 Watts), can close in on the review sample in both single- and multi-core performance up to a few percent. The E733 and E753 Premium LifeBooks are about twice as fast in the multi-CPU test. Owing to the efficient cooling, the Turbo levels of the review sample's CPU are maxed out. We neither observed thermal throttling nor performance reduction in battery mode. Like in the previously tested sister models, PCMark 7 did not run error-free due to an outdated graphic driver. Therefore, we rely on PCMark Vantage and PCMark 8 for assessing system performance. The first benchmark recorded a higher total score of as much as 135% for the E733. The Asus laptop can also still reap in an advantage of 49% here. HP's ProBook (AMD) again is last place with minus 38%. The Productivity Score shows a similar picture: E733 plus 209%; Asus BU400VC plus 76%; HP minus 40%. 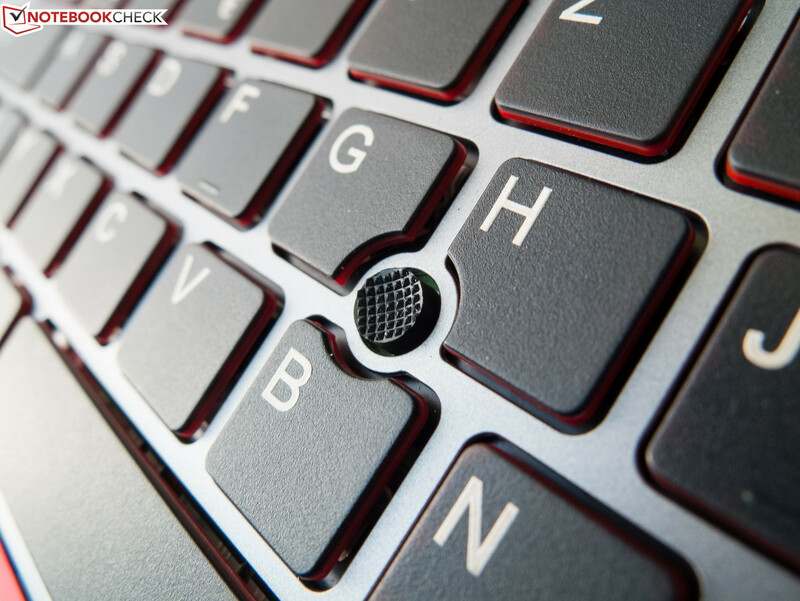 The quad-core LifeBook's advantage on our E733 shrinks to 21% (Home Score) and 13% (Work Score) in PCMark 8. We were impressed with the swift speed. Experience shows that there would barely be a difference to the quad-core models if an SSD were installed in the review sample. ...are within the expected range. The 500 GB HDD, called Hitachi Travelstar Z5K500 HTS545050A7E380, is absolutely unremarkable in both access times and transfer speed, and places itself in the average of comparable drives. 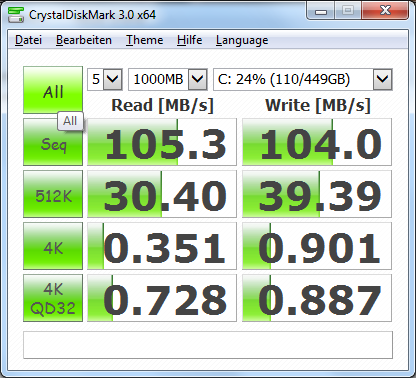 Modern, 5400-rpm hard drives are quite close in terms of performance nowadays. The Seagate Momentus in HP's ProBook benefits from the faster spinning 7200-rpm drive with an access rate of 15.5 ms in contrast to our review sample's 17.5 ms, although the transfer speeds are on the same level. 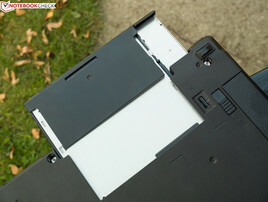 The SSDs in the other comparison laptops are in another league. It is very obvious that a faster model is installed in the LifeBook E733 than in the Asus laptop, which becomes even more apparent the smaller the blocks to be read are. 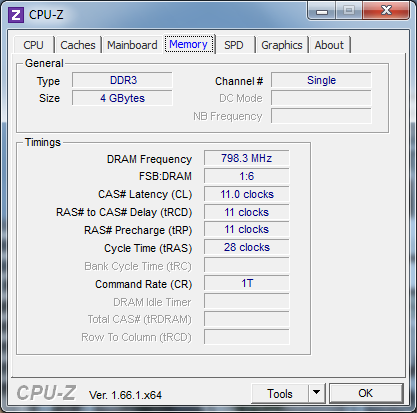 The CPU-integrated HD 4000 Graphics with a clock ranging from 650 to 1150 MHz is capable of DirectX 11 but usually cannot deal with current games even in minimum settings. Thus, it is mostly installed in office laptops alone, i.e. without a complementary dedicated graphics solution. HP's device is on a par in the 3DMark 2013 Ice Storm Standard Score in terms of performance. The Premium LifeBooks benefit from the faster quad-core and have a lead of 44%; the Asus even places itself before the review sample with a performance plus of 105% due to its dedicated Nvidia NVS 5200M. 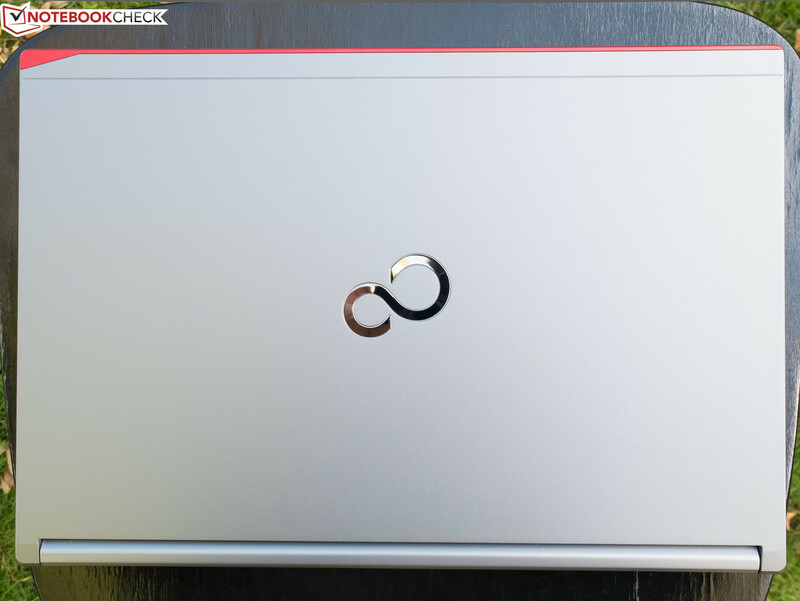 In the demanding Cloud Gate Standard Graphics Test of 3DMark 13, focused on the graphics unit, the LifeBook E733 and the Asus laptop manage a lead of 55% and 52% compared with the E743 and HP's laptop. It is evident that there would have been room for more when comparing the LifeBook review sample with other laptops that are based on the same CPU-GPU combination. Particularly the Asus Q500A-BHI7T05 is 38% faster in the Cloud Gate benchmark. We did not notice any limitations in battery mode. Up-to-date games are not a topic either for the LifeBook E743-0M55A1DE or for the other compared laptops. The Premium Fujitsus benefit from the stronger CPU, but still only achieve just playable frame rates even in minimum settings. The Nvidia NVS 5200M installed in Asus' device achieves a 40 to 50% higher performance than typical HD 4000 GPUs. That however does not make the BU400VC-W3040X into a gaming laptop. Older and/or less demanding games, like Diablo III, are no problem for any of the platforms. 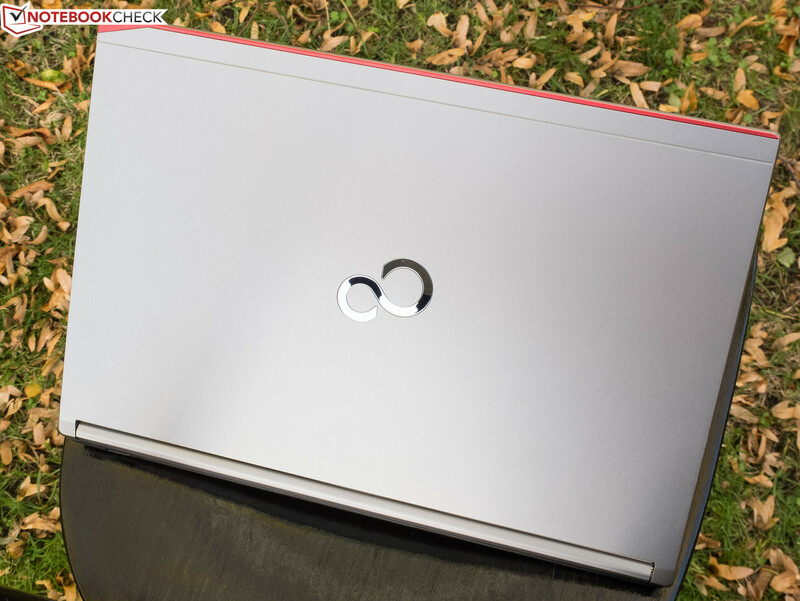 We will not go in-depth here because the noise levels of our review sample and the comparison laptops are so close in the different load scenarios, and they are all within a non-distracting range. The laptops can still be discerned from omnipresent background noises when idling, but are very audible during full load. 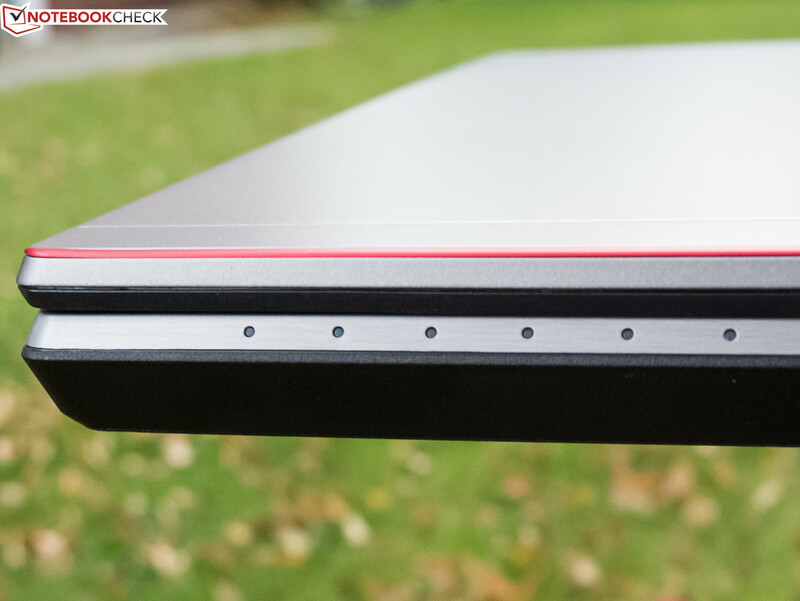 The LifeBook E733 only steps out of line during load; the review sample is considerably quieter here. Just like in the sister models, the fan's subjectively smooth and calm management does not give reason for complaint. 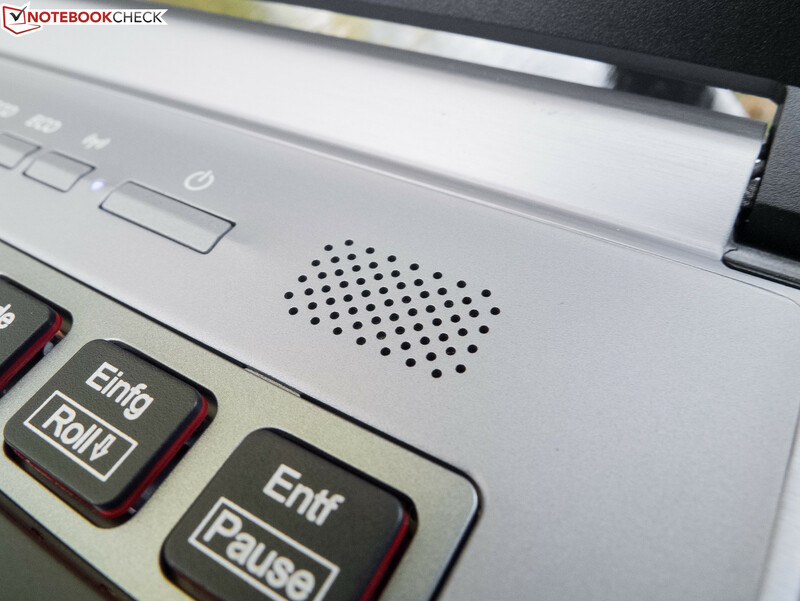 The tester could not ascertain obtrusive side noises from the LifeBook E743 either. We never noticed unpleasant surface temperatures while working with the review sample. The review sample's larger casing and lower CPU power, compared with the LifeBook E733, become evident with lower maximum temperatures in both idle and load (idle: 40.6- 47 °C, 105.08-116.6 °F; load: 47.1- 50.6 °C, 116.78-123.08 °F). 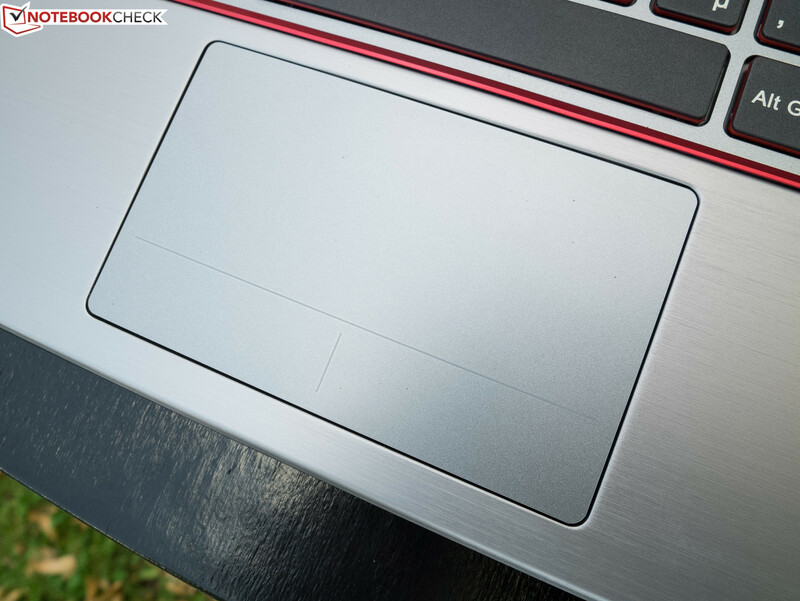 The laptop's underside partly got considerably warmer than the top, where an uncritical 39.1 °C, (102.38 °F) in the wrist rest's area were not surpassed even during full load. The one-hour stress test using Prime95 and FurMark did not show any irregularities. Throttling did not occur, which fits with the fact that the core temperatures never exceeded a moderate 84 °C, (183.2 °F). The speakers do not suffer from distortion at maximum volume, but they are unfortunately too soft to fill a typical 30 m² (323 sq ft) room. The low volume also takes its usual toll: there is no real, audible bass. Mids and trebles are rendered quite clearly, and instruments can be discerned well. 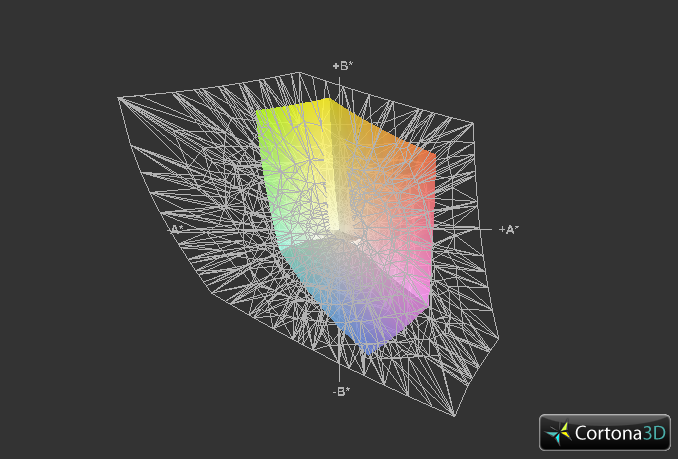 The sound profile has been synced to the speakers' limited possibilities quite well. The ALC269 codec can cope easily and adequately with most sound systems that are found in a living room. Die-hard audiophiles will not use an on-board sound codec anyway. Our review sample still consumed 0.3 Watts from the outlet in a turned off state. This is no longer appropriate. The standby consumption of 0.4 Watts is also in the lower third in the 14-inch office laptop category comparison. The average idle and average load consumption looks a bit better. The E743 is in the midfield here. The maximum power consumption of 45.9 Watts is no problem for the power supply. 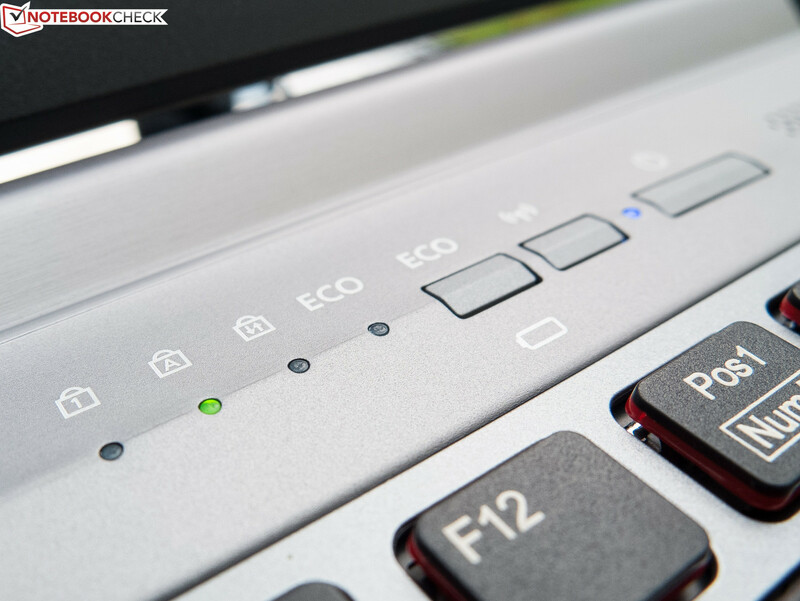 A pre-configurable set of power-saving options can be disabled or enabled via the handy Eco-button. 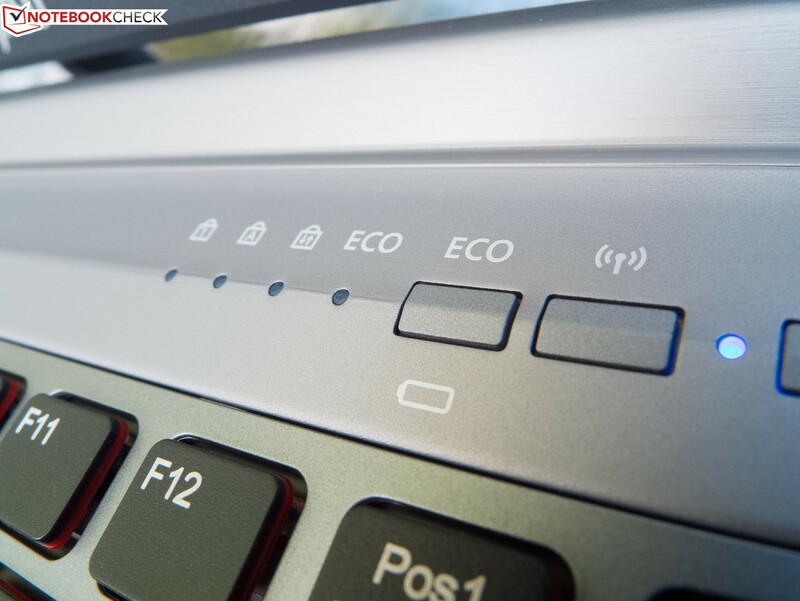 Our LifeBook E743 lasted for 5 hours in the practical Wi-Fi test, which opens Internet sites every few minutes. 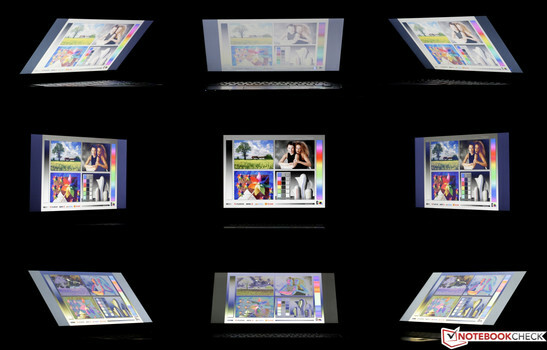 Energy-saving mode is enabled and the screen's brightness is set to approximately 150 cd/m² for this test. Although this rate is all right, it is not outstanding because the span for 14-inch office laptops is between roughly 3 and 7.5 hours, without exception. For example, our Asus achieves an impressive 6.5 hours (plus 33%) owing to its ULV CPU in this scenario although the 53 Wh battery is much smaller than the 72 Wh model in the E743. The E733 Premium LifeBook can surpass this runtime by 12%, likely due to the economic SSD; our HP laptop is last with a 12% shorter runtime than the E743. The LifeBook E733 (145 minutes) beats our review sample (89 minutes), and Asus' laptop as well as HP's ProBook (both 121 minutes) in load using enabled wireless modules and maximum brightness. A DVD ran a loop for approximately 4.5 hours with disabled wireless modules, maximum brightness and energy-saving mode, before the review sample shut down. 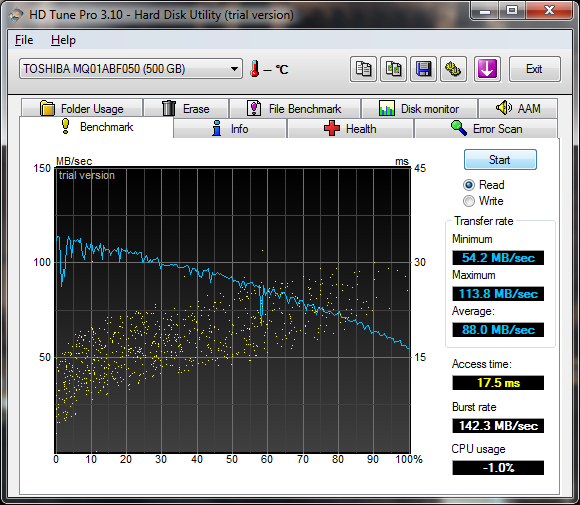 The E733 lasts a bit longer here, while the HP slightly lags behind again with a still good 4 hours. 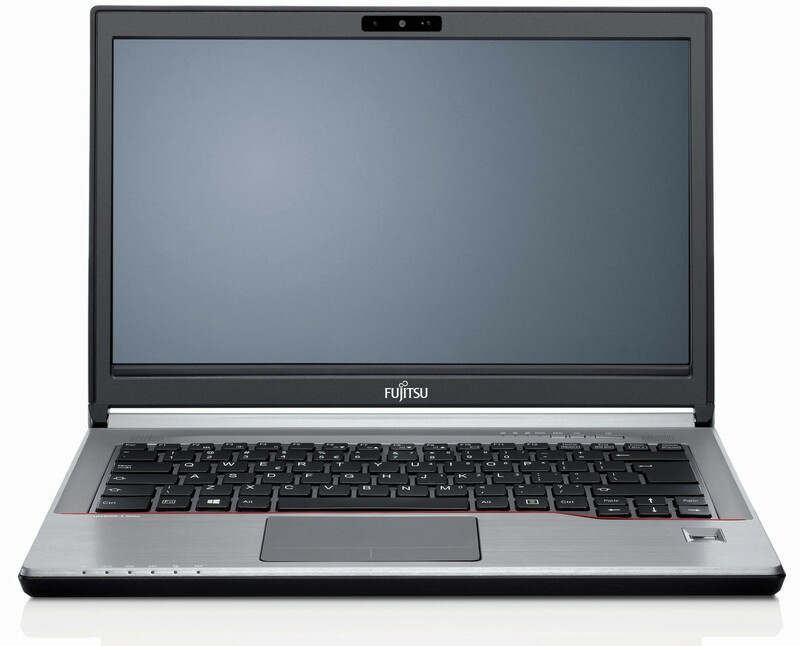 The DVD drive can be replaced with an optionally available additional battery in Fujitsu's E-series. 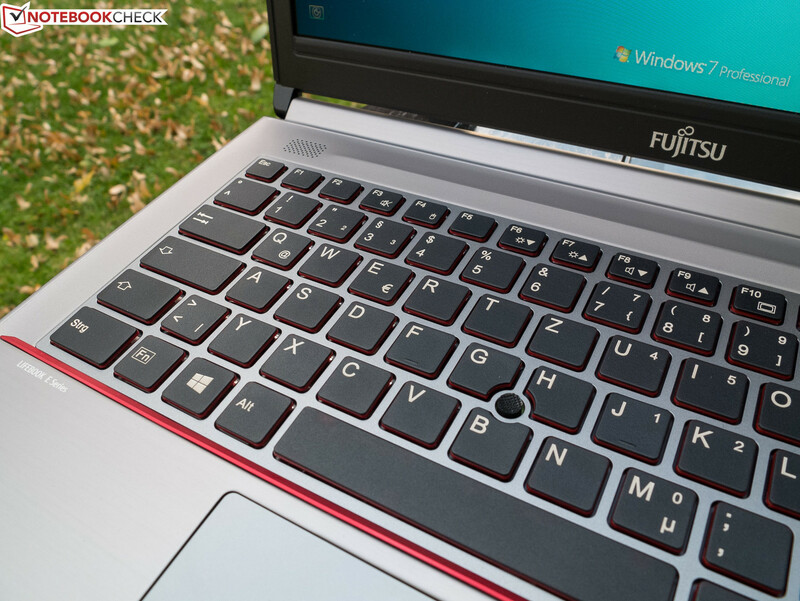 Of course, Fujitsu's LifeBook E743-0M55A1DE cannot keep up with the speed or configuration of the Premium models of the E-series, such as the E733-0MXP41DE, because they sport cost-pushing features like genuine quad-cores, SSDs and extras like LTE/UMTS. In our opinion, the review sample's input devices still meet professional requirements but are nevertheless slightly inferior to those in the E733. Despite that and considering the big price difference, we found the E743 more appealing than the previously tested, higher priced model. The reason for this is that the E733 is overpowered for the intended application field and comes with a much poorer screen than the review sample, which did a surprisingly good job in this point. We find that the review sample's configuration and performance is balanced. As experience shows, the average user would not notice a performance difference between this device and the Premium LifeBooks if an SSD were installed. All vital security features for business customers are available; the interface diversity should fulfill virtually all wishes that the target group might have. The good battery runtimes, low weight and the rigid, representative casing stand for mobility. ...the colorfulness of the ambient light. Red borders add optical highlights. ...only a few are on the left front edge. ...ECO button and wireless on/off switch are also found. ...is also found on the keys' sides. Not inevitably needed: a touch stick. The port replicator is only included for the Premium models of the E-series. ...besides the base unit's non-slip underside. The optionally available dock with port replicator adds many additional interfaces. The great casing, the still decent input devices and the good runtimes. The E733's touchpad - and a backlit keyboard cannot be that expensive. 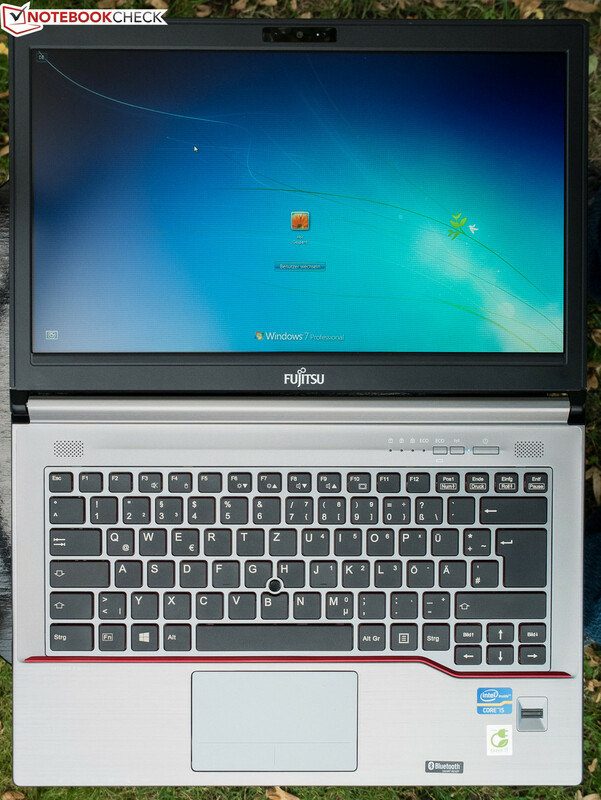 Fujitsu managed to put more laptop in the E743 for $1260 than in the E733 for $2144 - both from the same series. That's weird.